You needn't be particularly involved with the smartphone world to notice the considerable – and more importantly, constant – growth in devices' dimensions. This observation has been cemented time and time again, and it appears that LG is next in turn. Still hot off the conveyor belt, the high-end G Pro 2 is one big phone at 5.9 inches. That's a considerable jump from its 5.5-inch predecessor – the original G pro. But while the phablet form factor may have been something pushed down our throats by manufacturers initially, there's no denying that the wider public response has been overwhelmingly positive. Demand for phablets is now large enough that every handset maker is scraping to get a phablet of their own out on the market. Packing a potent, 2.3GHz quad-core Snapdragon 800 and 3GB of RAM, the G Pro 2 handles everything and anything you throw at it with finesse, and the same type of results are achieved by the optically-stabilized, 13-megapixel unit on the rear of the phone. Before we get into this, however, do keep in mind that our review unit is the Korean version, which may differ in some aspects from the international model that we expect to reach the shores of Europe and the States in the coming months. 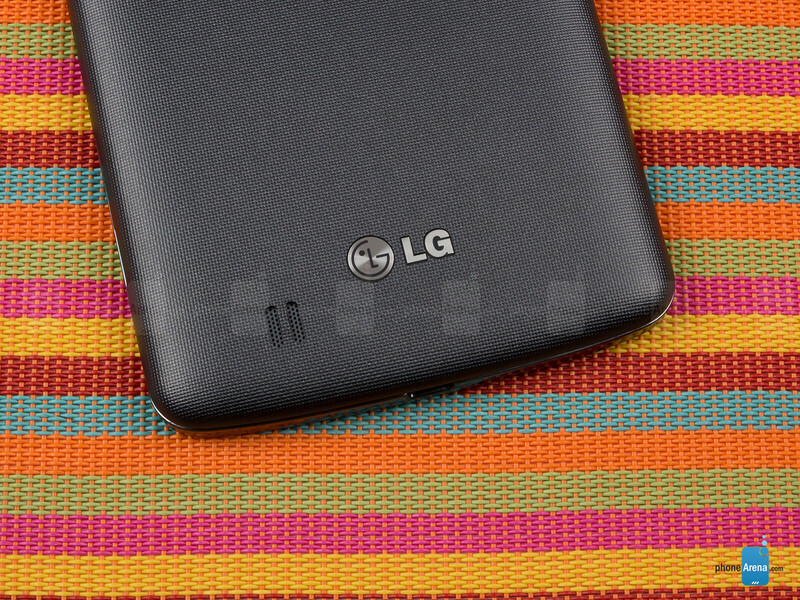 We're still expecting LG to shed some more light on specifics, such as carrier availability and release date. A lot can and should be said about the G Pro 2's exterior. 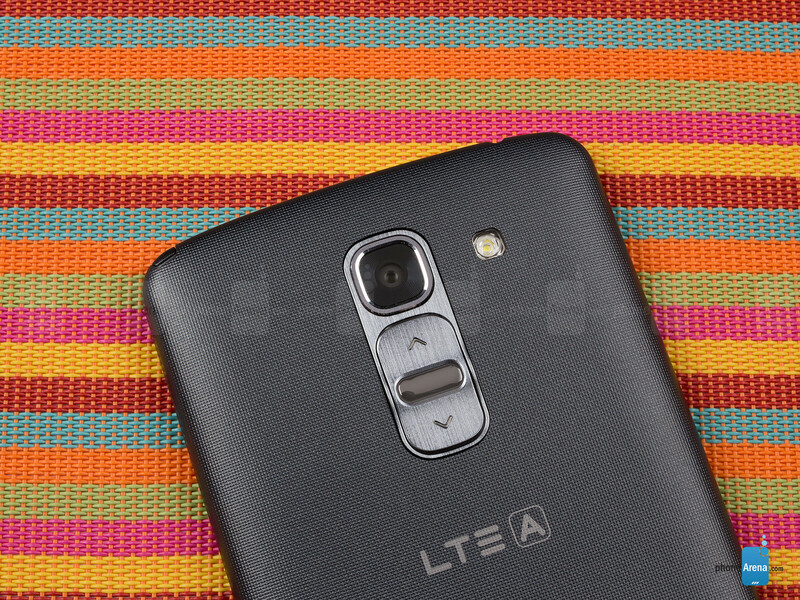 For starters, this is one sweet-looking device, even though it's unlikely to win consumers' hearts on looks alone. LG hasn't used truly premium materials with the build of the device, but there's simply no way that one would confuse this for anything less than a top-of-the-line phablet. Starting with the front, we have very narrow bezels all around, so this is a relatively conservative device in terms of its dimensions (6.22 x 3.22 x 0.33 inches). In comparison, the 5.9-inch HTC One Max commands dimensions of 6.48 x 3.25 x 0.41 inches, so it's considerably larger and thicker. We also simply have to point out how light and well-balanced the G Pro 2 is. At 6.07 oz (172 grams), this is possibly the lightest phablet in its class, and it isn't top- nor bottom-heavy like some devices we've come across. In other words, while this will never be seen as a one-handed device, it's still more comfortable to use than quite a few other phablets in this size class. Anyways, those aforementioned bezels all tout a fancy texture which shimmers under light, much alike the rear of the Nexus 4. In comparison, the rear is less intriguing. The plasticky shell has something of a mesh texture, which doesn't exactly scream premium, but it does feel practical. Moreover, the G Pro 2 borrows the rear-placed volume and power buttons from the G2, and these are worth a moment to discuss, because they have seen some noteworthy improvements. For starters, they're now far less flush with the surface, and you can make them out by touch alone, which definitely helps. What's more, they have a roughly doubled travel time upon impact and you don't have to push too hard to get feedback from them. 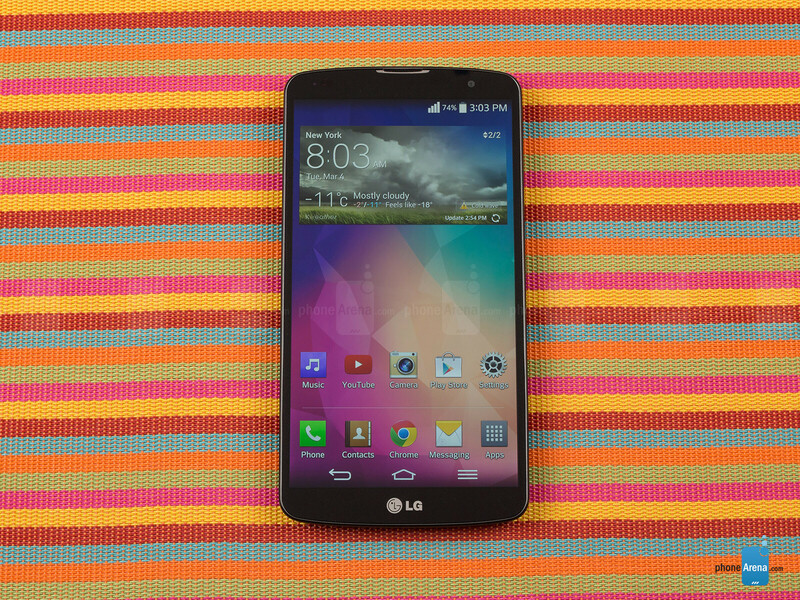 We never quite warmed up to the rear combo, as outlined in our long-term LG G2 review, but the G Pro 2 definitely begs a rematch. The Quad HD displays madness surely appears unavoidable at this point, but the G Pro 2 won't be the device that pushes that frontier for LG. This means that you're getting a 1080x1920 pixel resolution with that 5.9-inch glass, or some 373 pixels per inch. This isn't just a 'good' display – it's downright beautiful. But an attractive display often comes at the expense of a proper color calibration, and the IPS panel on the G Pro 2 is no exception. Brightness, at 420 nits, and gamma, at 2.17, are both satisfactory, but color reproduction is, strictly speaking, incorrect. With a color temperature of almost 8000K, this is not the most accurate of panels, though color deviations from the target are not that extreme. But whites are perceptibly blueish and this does extend to grays, as well, which is a tad unfortunate. Um... How on earth does this device warrant the same score as the Note 3? It benchmarks worse despite being 4 or 5 months newer, and lacks the productivity benefits of the S Pen. What am I missing here that puts this device in the same league as the Note 3? Yes,it's surely weaker than note 3 and z ultra,those two are real phablets. Good point. Will be interesting to see if the author actually replies to your comment. I think you have to put it in the same category at least. Similar camera, battery, screen size, RAM. Not that it would out perform the Note, but still a decent phone. Yup, very similar, only it benchmarks worse despite the fact that it came out months later. And then there's the S Pen... I'm not saying it's bad or that it deserves a low score. I'm just saying that I can't see a viable reason for it to have the same score as a superior device that's been on the market for a good long while. True dat. I agree about the scoring. Why not use antutu x where no phone can cheat? Duh ! That's because G Pro 2 wasn't released when this was reported. I find hard to believe that its little sibling is cheating and the Pro wouldn't. I think you have a good point, but you are basically saying that the Spen gives zero affect to the scoring system. Which I consider a bit unfair. A lot of features come with the Spen and some users probably use it a lot more than others. Some jobs might actually really benefit from the Spen / Note 3. It also makes it a bit easier to multitask and use those settings. I have big hands and the Spen would make my experience a whole lot better. The fact is, that it's there for the people that need it obviously. Different reviewer maybe. And them being realistic. Frankly, if every phone was rated fairly, Samsung would clear the table. If I was a fan of AMOLED displays I would no questions ask buy a Samsung over any other device. Since you can't really give Samsung phones 10's and every other companies phones 8's which would create a storm and alienate all the Samsung haters, they have to use two different scales. There is a Samsung 9 which is a true 9. And then there is a everyone else's "9" Double standards exist everywhere. Just live with them. The Note 3 definitely lost marks it probably shouldn't lose. Like a no longer in the honeymoon period human nature deduction for the Note 3. Simply the Note being the 3rd iteration and the GPRO 2 being the second iteration does cloud your perception a bit. The GPRO 2 is newer and we all like new. Youre one of those clowns that judge a phone by a number.... Phuck outta here. How on earth note 3 scores are equal to this....lg g pro 2 is far far better than note 3...i have used both and kept lg g pro 2 and returned note 3 for obvious reasons... the display and brightness is stunning...even though htc one max is 469 nits ..lg g pro 2 display brighter and crisper than it even at 420 nits. note 3 screen is dull and one finds no reason to upgrade from note 2....except that note 3 is a tad bit faster and larger. note 3 is largely over-hyped and being the proud owner of note 2 since 2 years...i can say note 3 couldn't beat it on upgrade scale. I like the design, just wish it was on the smaller side of 5 inches. I am personally not ready for phablets, I don't think I ever will be. 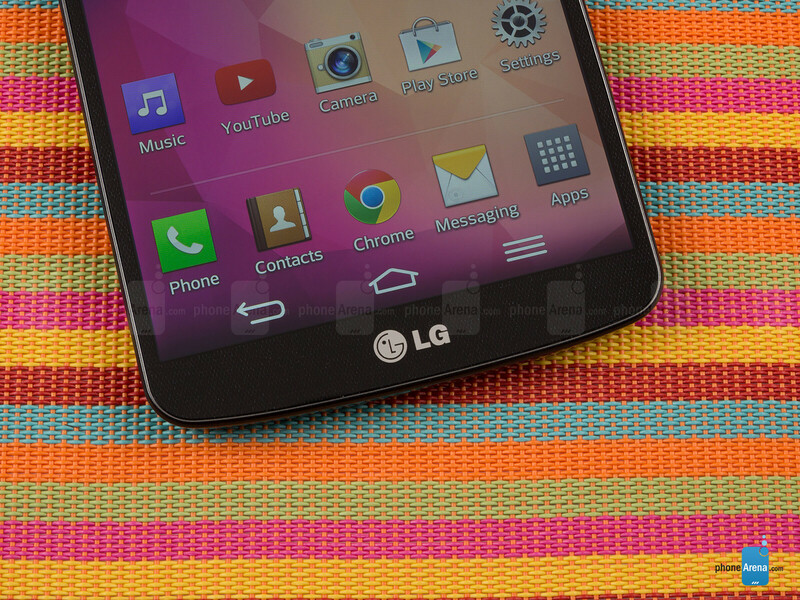 The 5 inch form factor of the GS4 and Nexus 5 is just about perfect for me. I would not be happy having to operate a device with 2 hands most of the time. But that is just me. I used to think the same thing until I bought the Note 2 and 3. Doubt I'll ever go back. 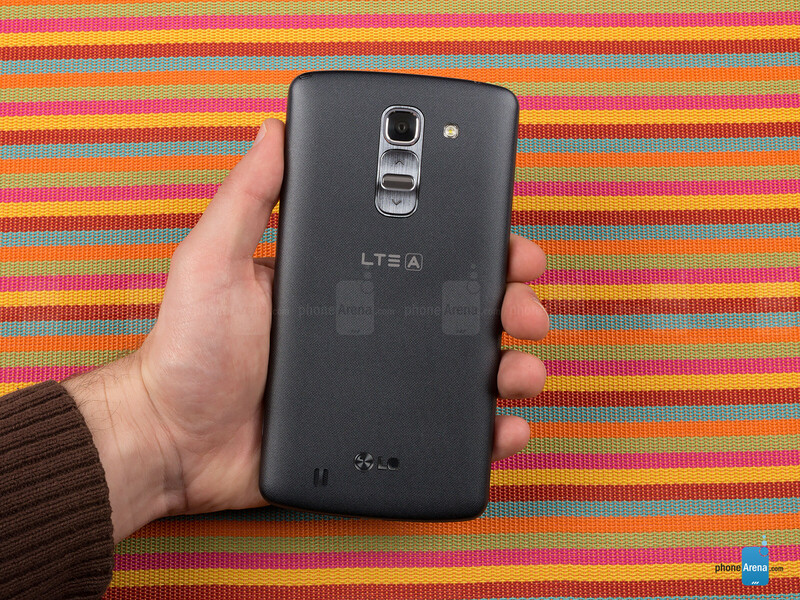 How is this device in the same league as the Note 3? The note 3 at least offers the best productivity to be found on any smartphone in the planet. no its not. note 3 contains too many features than any smartphones because of its S pen that makes the user experience the note 3 more than just a phone. and like no other. Note 3 still reigns supreme..